- Ancient Greeks generally believed that Homer was a historical individual, but some modern scholars are skeptical: no reliable biographical information has been handed down from classical antiquity. - Scientists, Marcelo Magnasco and Constantino Baikouzis, at Rockefeller University conclude that 1178 B.C. as the most likely date of Odysseus' return. What made me want to read more about Greek tales and folklore was Edith Hamilton's Mythology. It was the core to my "Greek mania" as I called it, and the two books that I obsessively wanted to read during those times were Homer's two timeless tales, the Illiad and Odyssey. I had a little problem, though. I wasn't able to understand the greatly and wonderfully composed poetry of the said tales. Eager as ever, I looked for other ways or forms to read them and was greatly rewarded when I found W. H. D. Rouse's prose translation, which I thought was great for starters. 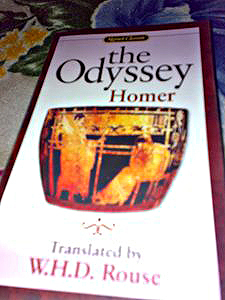 Homer's account of the adventures of Odysseus has stood at the center of classical literature for centuries. 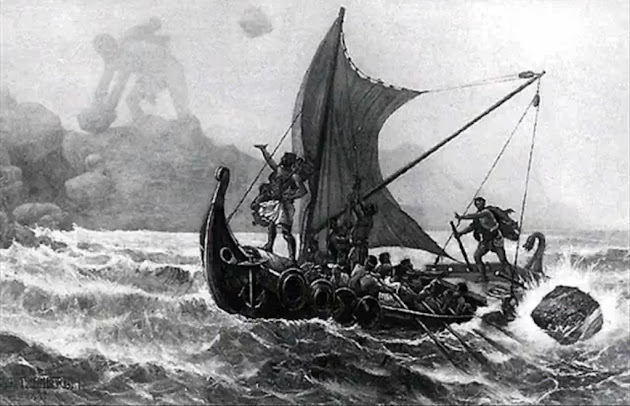 It is a sweeping story of a great warrior who wanders the world as he take on a decade-long journey as he flees Cyclops, angers his gods, resists the Sirens, averts his eyes from Medusa, docks in exotic cities-ever longing to return to his wife and son. But aside from that this tale is also an intensely domestic tale of a loving husband's struggle to protect an enduring union with his faithful wife. Meticulously studied and commented upon by innumerable scholars, The Odyssey remains, nonetheless, a uniquely personal literary experience, startling each new generation of readers with its excitement, its drama, and its remarkably contemporary hero. Although we know very little about the author of The Odyssey and its companion tale, The Iliad, we can't deny the greatness of his works. Let the experts quarrel over the author's real identity. Was he really a single person? Was he blind as the great legends said he was? Or was there really a famous writer called Homer? I agree with most of your points. Often times it's the story that makes great authors, but for the rest it's the other way around. There's no rule really as long as it makes reading a worthwhile experience. I bought Chaucer's Canterbury Tales as well, but I unfortunately left it at home before I could even manage to read it. Thank you, Nancy, for stopping over.